How Was I to Know?!? So I discovered today why people are willing to shell out a lot of money for a good stroller. I got my B.O.B. 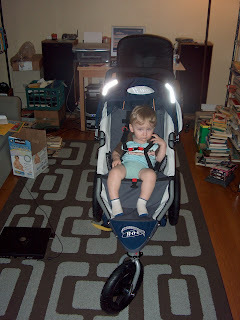 Revolution Stroller in the mail yesterday, and I LOVE IT. Up till now, we've been a strictly umbrella stroller family. Well, no more. I'm not sure I am willing to give up my BOB Stroller. The BOB has such a smooth feel to it. Granted, we've not gone outside with it yet, but I can tell already how much I'm going to love this thing. It's lightweight and SO easy to put together. E$ and I wheeled Noel all around the house. He was having a great time! We both said that it's almost like the stroller is doing the work and you're not struggling to make it go. When we go to put Noel in the umbrella stroller, it's tear city. Today, he was laughing and enjoying himself. There's room for him to move around, room for drinks and snacks, and room for up to 10 lbs. of cargo underneath! As if these weren't enough selling points, you'll have no more wheels getting stuck in a weird position...the front wheel turns 360 degrees! This is the Mercedes of strollers. 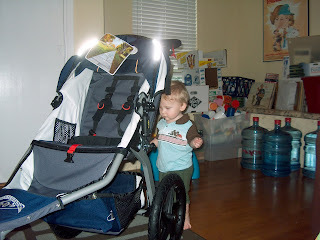 I am on board the BOB Stroller train-jump on with me!